What a difference a week makes. 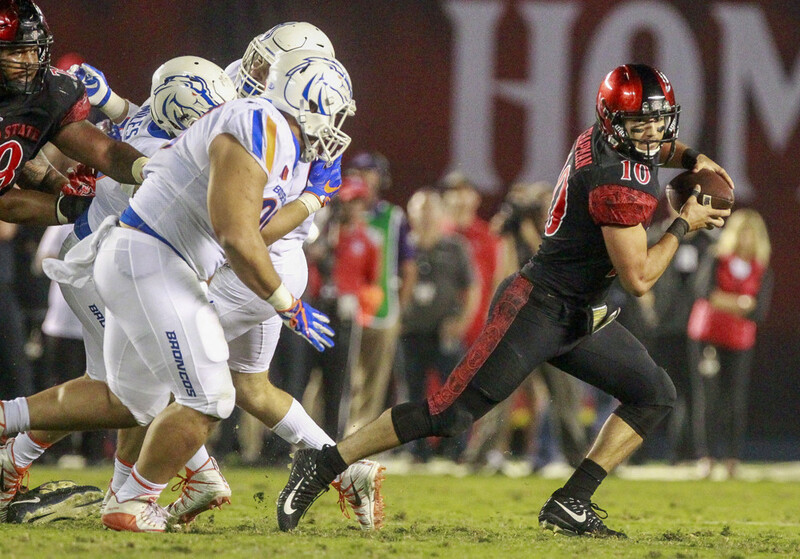 The San Diego State football team started the week on a high after winning its sixth straight game and becoming bowl eligible and ended on a low after being upset by Boise State. The Aztecs (6-1, 2-1 Mountain West) were also dropped from the rankings Sunday after starting the week ranked No. 19 in the Associated Press poll and No. 18 in the Amway Coaches Poll. No. 18 was also the highest ranking for the Aztecs in 40 years. Coming into this week, SDSU was one of 13 undefeated teams in the nation. While the players may have aspirations of an undefeated season, coach Rocky Long was more realistic, noting that last season, no Division I team was undefeated. The Aztecs had a rough start Saturday night when a punt was returned for a touchdown and a turnover was converted for another in the first quarter, giving the Broncos a 14-0 lead. Boise State (4-2, 2-0) added to that lead in the second quarter with another touchdown. It wasn’t until the third quarter that San Diego State got on the scoreboard. “It’s hard to break the momentum and get things going the other way, especially if you can’t move the ball on offense,” Long said. Long hoped the loss is just a mid-season stumble that will motivate the team for the rest of the season. SDSU’s 6-0 start is the best for the program since 1975. The Aztecs will now face their rivals, the Fresno State Bulldogs (4-2, 3-0) , next week at SDCCU Stadium. The Bulldogs are currently undefeated in the MWC, a position held by the Aztecs until this week.